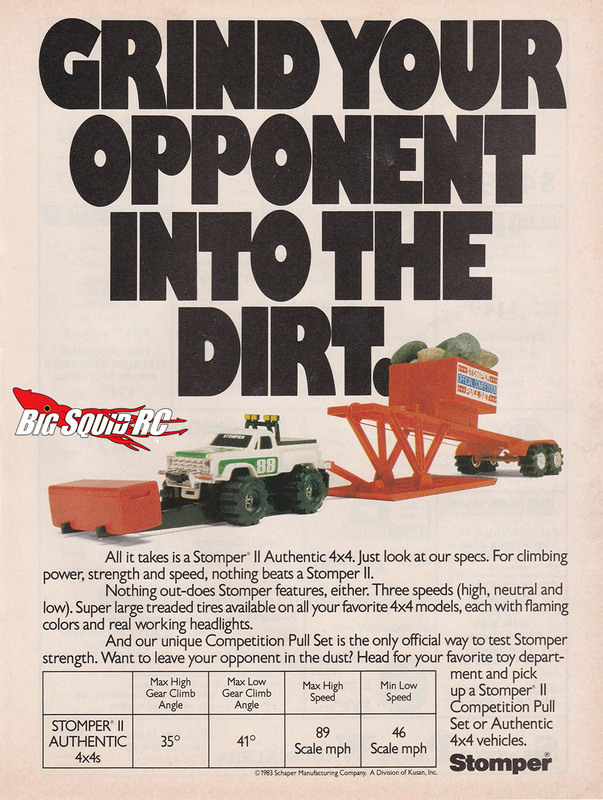 Everybody’s Scalin’ – Stompers, the Original Scaler « Big Squid RC – RC Car and Truck News, Reviews, Videos, and More! Whenever there is discussion as to what was the first “real” scaler, there is always playful argument. Some say it was the SCX10 since it brought it to mainstream. Others bring up Tamiya’s legendary (and legendarily expensive) Bruiser. Those vehicles are fine and all, but I think the first true scaler was something else. Something a lot smaller. Heck, it wasn’t even radio controlled. The Stomper! Stompers, by the Shaper, took the toy world by storm during the 80’s and as such were the go-to rig of many would be off-roaders. The vehicles were battery operated with full time four wheel drive, and were characterized by brightly colored truck bodies with aggressive rubber tires. The original line of toys started out with just a few different models but their popularity skyrocketed…and so did the available variants. Semi trucks, construction equipment, outlandish concepts, etc. Soon enough they were available with multiple speeds, working headlights, and larger scales. The trucks, cool as they may be, were but one part of the equation. 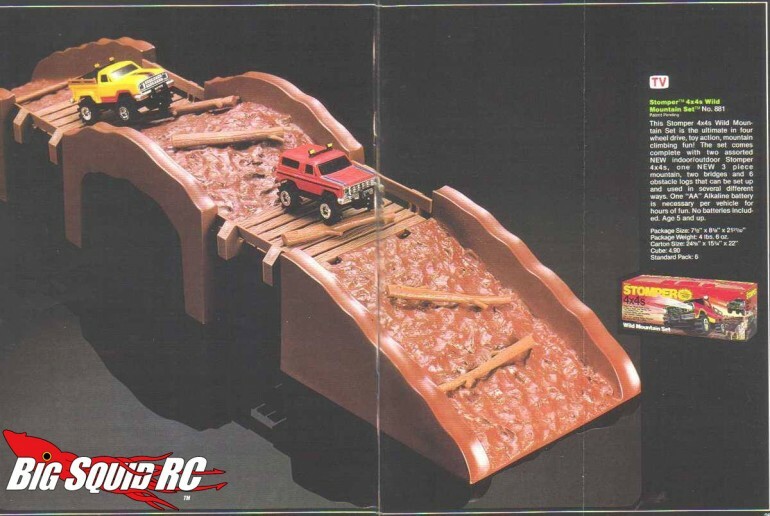 They also had playsets…and oh baby, how awesome they were! Courses like the “Wild Mountain Set” above were incredibly badass. My personal favorite was the pulling sled (see ad below). There were so many and most were insanely cool. Here’s the thing with nostalgia – many times it colors our perception of how things really were and therefore makes us tend to think things were better. As someone who got their hands on a few late generation Stompers a few years ago (sadly long before I worked for Squid) I can assure you that they are just as awesome as you remember. They can tackle many types of terrain, are tough, and look great against the modern glut of run-of-the-mill fare you’ll find in an average toy store. I may not of gotten my first r/c trail truck til around 2010, but thanks to the Stomper I was scaling back in the late 80’s and just didn’t even know it yet. I reckon many of you feel the same.